Our modern studio will be your cozy cocoon in the city center. 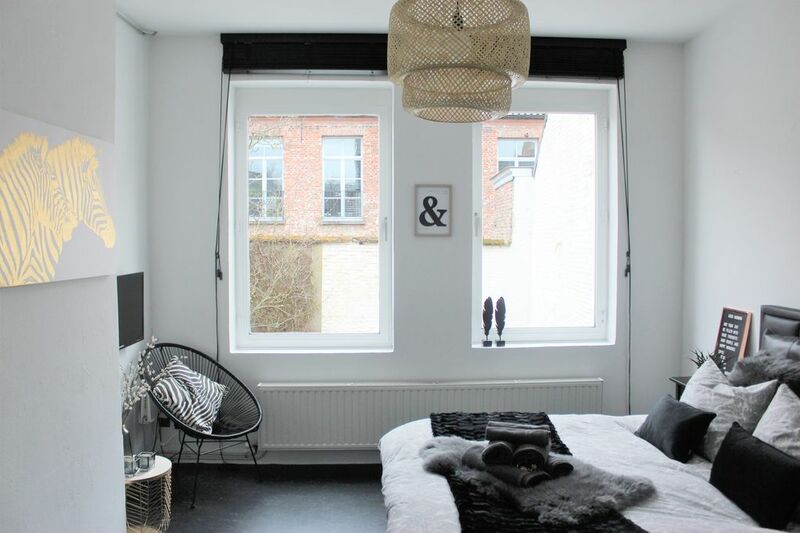 If you are looking for a short time stay in Ghent, 'SUITE CESAR' is the ideal place for you! We provide a fully furnished, modern and affordable studio with room to 2 people. It's perfect for couples or solo travelers! Also as a base for a visit to Bruges, Antwerp or Brussels our location can be added value. Suite César is located in a prime location in the historical center of Ghent. Situated in the Tinnenpotstraat, a charming and quiet neighborhood, a few minutes walk from the bustling center. The Tinnenpotstraat owes its name to the hostel 'In the Tin Pot' (house number 44-46). It already existed in the 14th / 15th century and can still be recognized by the sign above the door. This street is also famous for the Tinnenpot Theater on number 21. Nearby is the Prinsenhof, created by buildings around the Hof ten Walle, the residence of the Viscount of Ghent. This Hof ten Walle was the birthplace of Emperor Charles V and was named from then on 'Prinsenhof'. 400m away from the Gravensteen Castle is a charming medieval castle in Flanders.